From June 12 to July 13, 2014, Brazil will host the 64 matches of the FIFA World Cup 2014. Straight through the championship match in the Maracanã Stadium in Rio de Janeiro, over 600,000 international visitors are expected to make the journey for the event where they will cheer, chant, and do whatever it takes to spur their national teams to victory. If you are planning to catch the FIFA World Cup 2014 in person at Brazil, you should start planning now as World Cup tickets (available through the FIFA website or through travel agencies) and accommodation are expected to be all snapped up soon. There is a few ways you can get to be in Brazil for the FIFA World Cup 2014 without the hassle of arranging your trip and even having it all expense-paid for you and your trip companion! Visa is currently running lucky draw campaigns with Changi Airport til 30 April 2014 where 3 Grand Prizes offering trips to the Brazil FIFA World Cup 2014 are on offer! 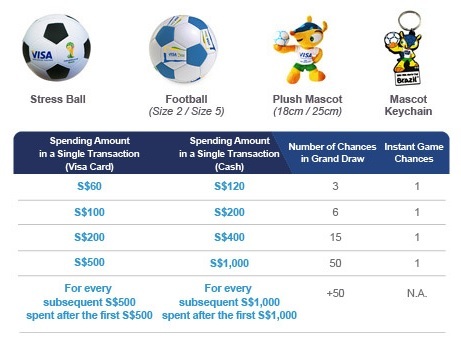 Spend a minimum of S$60 with Visa from now til 30 April to get Visa FIFA World Cup themed premiums (while stocks last) and stand a chance to win exclusive trips to Brazil for the 2014 FIFA World Cup™! Click here for terms and conditions. Besides a shot at the 3 Grand Prizes (see more details below), you also get a chance at an Instant Game to win the following World Cup collectibles. 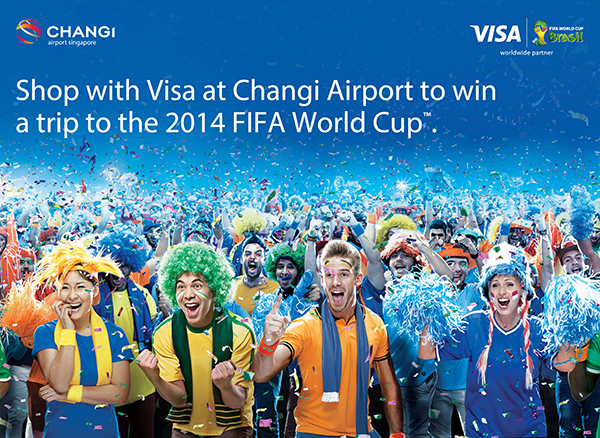 Even if you are not shopping at Changi Airport with your Visa credit card, you can still stand a chance to win that trip to the Brazil 2014 FIFA World Cup™. 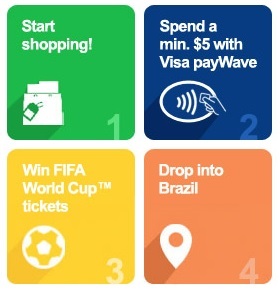 Just use your Visa payWave Credit or Debit card from now til 30 April 2014 at any Visa payWave merchant and you could win a trip for two to the 2014 FIFA World Cup™ in Brazil. Terms and conditions apply. Minimum spend S$5. Click here for the list of Visa payWave merchants.